The Radium also has a significant amount of spectral output from 460 all the way up to 850nm. As far as I'm aware the Current Marines only have 445nm and 460nm diodes on the blue channel (possibly some RGB mixed that is insignificant). @littlelise1985 , a T5 retrofit gives you a lot of flexibility to experiment with different light combinations. They're somewhat power efficient. However, a retrofit might drive you toward building a hood which inherently traps heat - meaning you'll have to think about how to vent the hood, possibly installing fans. The light from a T5 array is very evenly distributed. You won't have "glitter lines" and shadowing is better than some other lighting approaches. When really high light is provided, I've seen corals take on a more pastel coloration compared to metal halides. Over time, the spectrum from any given lamp will tend to shift. T5 lamps require replacement every 9 to 15 months so, while fairly power efficient, may be a little harder on the pocketbook. For the widest selection of lamps, you'll have to look online and, as you might imagine, shipping can be an issue. When I ran T5's, I used mostly Blue Plus and Aqua Blue Specials, supplemented with Actinics and KZ Fiji Purple. The tank had a decidedly blue cast - in the range of 14K. 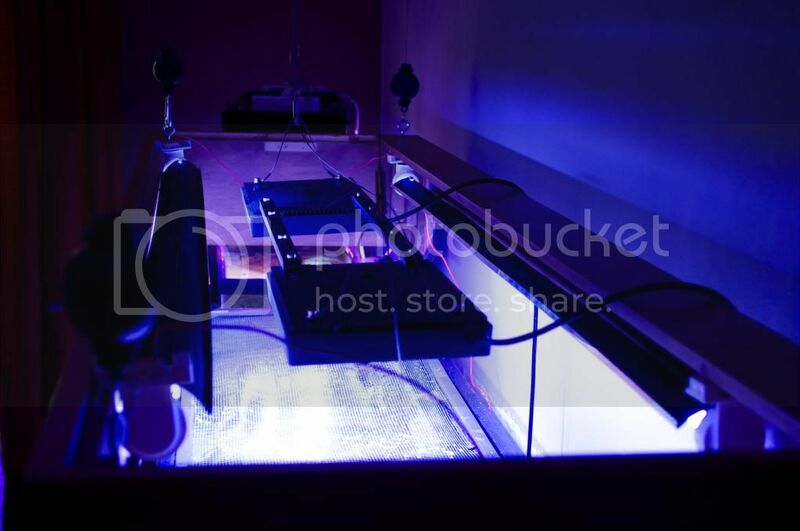 Metal Halide lamps have a long, successful track record in reefkeeping. Some still swear by it and run beautiful tanks with them (e.g. John Coppolino). The choices of lamps there are more-less discrete, meaning that you have to experiment with different light sources and brands to find what you like. 20K radiums have a very blue spectrum and are used by a lot of high-end coral growers. (I believe that John is one example of such a user. Jason Fox may be one as well.) 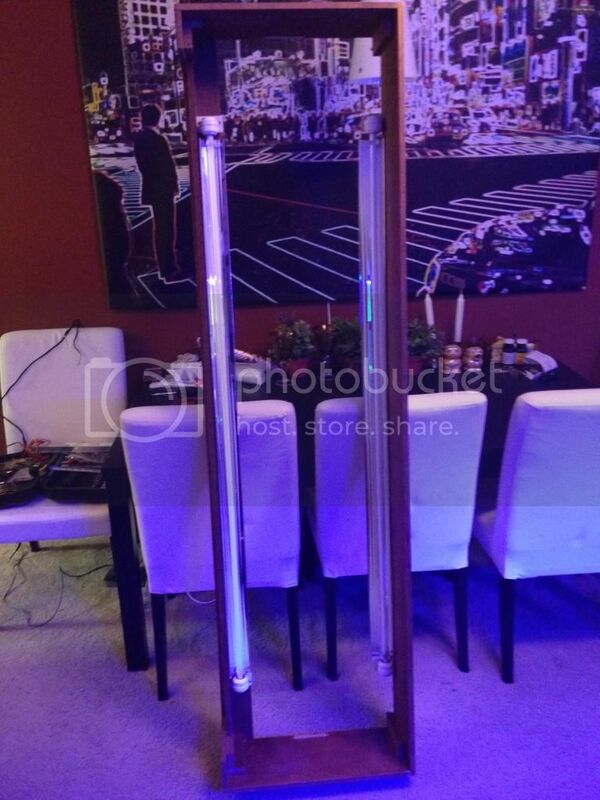 When I played with MH, I gravitated toward a Phoenix 14K lamp and to no-name Chinese lamps with similar coloration. MH lamps are a point light source and their lighting will give you so-called glitter lines - lines of light that dance through the water column as light is refracted off the agitated water on the surface. These glitter lines intensify the light randomly and are thought to help reduce shadowing under coral branches giving better polyp coverage on individual branches. MH lamps tended to last me about 6-8 months before needing replacement. Early on in the Reef-LED "revolution," there were no real commercial sources of LED reef lighting. And, when they began to appear, they were very expensive. A lot of us built our own using a 50/50 mix of 3W Cree Royal Blue and Cool White LEDs. You could buy kits from various sources and, depending upon the complexity and number of drivers you chose, you could vary spectrum somewhat, shifting from very blue (20K-like) to white (10K-like). Or, by running both colors somewhat equally, you could get a 14K-like color with high intensity (because you could run both strings near full capacity). LED's run hot so dissipating their heat is accomplished through a heat sink otherwise their lifespan is severely affected. They're quite efficient initially. There are also a lot of sources, including cheap sources, of these lights today. Spectrum is adjustable, but only to the extent that the number of drivers and LED string configuration allows you to adjust. Of course, if you're handy, you can take one of these cheap lights and replace the LEDs that you don't want with others that you do and completely change things up. For example, if you wanted to go LED and you purchased a couple of $100 two-channel Chinese LED specials, you could buy a handful of LEDs and swap out the reds and yellows with blue, or whatever else you wanted and get more light in the color bands that you find more appealing. After several years (3-4), I've found that some Chinese lamps start to fall-off and die, mostly because LEDs are failing. The heat-sinking and cooling on some of the lamps isn't great, so the LED life is compromised. But, if you can troubleshoot the problem, many times it's easily repaired. "Significant" is subjective. The light from a Radium is decidedly blue. There are discernible peas,but they are 17% of the primary peak. That is, more than 7dB down and more. 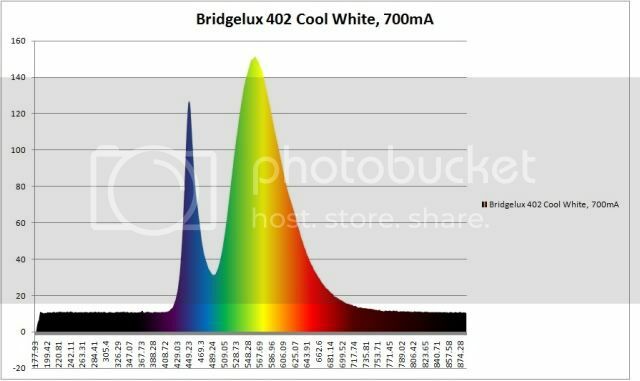 Even blue T5 lamps have spectral components outside of pure blue - the ATI Blue Plus spectrum is a perfect example of that. Here's the Blue Plus spectrum from ATI. My point is, would you attempt to keep corals under 445 and 460nm lights because you like the way it looks, or provide the coral with what it needs to remain healthy (with an understanding that littlelise1985 is attempting to find a better solution)? Coral pigmentation comes from wavelengths across the entire spectrum, not just blues. I understand the appeal of viewing a tank with heavy blues due to florescence, but the colors of many corals cant be maintained without a more complete spectrum (especially when considering only two wavelengths). Edit: I don't mean for this to sound like an aggressive rant, that isn't the intended tone. Not to worry. It's not taken that way. My point is that many very beautiful tanks with sustained coloration that you might find crazy that have run for years and primarily on predominantly blue-dominant lamps. The OP may not be so concerned with being spectrally pure, but may be favoring a "blue look" that may well include other spectral components. That's how I'm reading it, at least. I agree that the 90/10 balance that the OP has may seem low but if spectral efficiency is equal between the two banks, then the spectrum is probably not too far off where Radions operate (remember the 1:6 and lower ratio of sidebands to blue with Radions). Maybe that's where we're not finding common ground. Some mix of white and blue still looks blue to most of us (because the white is perceived as no color at all, I guess). The balance between blue and white becomes one of personal preference. Over the years, other colors and bands have entered the picture (with Red being possibly the one with most visual impact to add pop to our red and orange corals and UV which some think might still be needed), but Blue/White still works quite well. Although your question's been answered, I feel like this conversation is in the weeds, haha! No one is ever satisfied with their tank, but that's the fun part. There is always something to work on improving. I don't know what the budget is, but there are lots of long term solutions that have been suggested that aren't too pricy. What exactly is the problem with supplementing with t5s in an AquaticLife fixture or getting some led strip lights (reefbrites, sbreef, or similar)? Something you also could consider, is to possibly change out some of the LEDs. Since you are not turning the whites up to 100% and using the full potential of that channel. 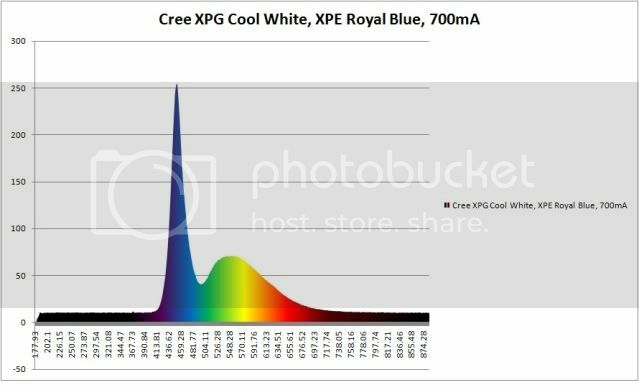 You stated you did not like the look of the whites at 100%, you could change some of the white LEDs to different spectrums of blue or other colors. I don't think it's possible to change out the LEDs on these fixtures. They are embedded in what appears to be epoxy. Some are very easy to change, if you know what type and can get them. I did try google to find out, but had no luck. Why does it specifically have to be one thing or the other? Just because you have success with T5 on your DT doesn't guarantee it on another tank. You could just run your current lights 100% while you're at work, and then when you're around to view the tank keep it to the spectrum you like to observe it in. Maybe even extend your photo period a bit. To quote Zygote, who I think has given up preaching ease to all of us "It's light, it grows things." I originally posted this to simply see if anyone has a good idea of how to easy mount some T5 fixtures and did not intend it to be a lengthy discussion about my personal preferences and why. This light is not bad but it also does not give me the flexibility and control that I want. I do not have a set time each day when I am out or will be home (and personally, I am lazy) and do not want to have to "change" the light every time I walk into the room. Why T5? If you have success with it, why not try and replicate it???? There is never a "guarantee" for anything, but better chances of success. That is my philosophy anyways. Others might not agree. "It's light, it grows things." I am sure Mr./Ms. Zygote is a very smart person but I don't completely agree with this statement. It's like being given a cake everyday as your only meal. "It's food, it will make you full." Admin, please close this thread. thank you. It's easy to mount T5 retrofits. You just have to have something to mount them to. YHSublime had an interesting approach with his open-topped canopy/frame that looks like it's hanging on retractable cable hangers of some sort. But, I've seen them mounted on a simple i-structure made from 2x4's for example for back-room frag tanks, too. Because they require ballasts, T5 (and MH, too) will often have heavy wires running up to the fixture to deliver the power from a remote ballast. While you have the ability to adjust color, it's mostly through lamp color which means buying a new lamp if you're not satisfied with the look. Some ballasts offer the ability to adjust intensity, too. However, you may find that a little more difficult to implement in a retrofit kit - not impossible, but more involved. You can control on/off times with a simple heavy-duty timer that'll set you back about $10 or can tie it into an Apex or some other controller. You might be able to control your existing light similarly (with timers). For supplementation and not a full change-out, T5's or some kind of highlighting strip might work for you by setting them up outboard to your existing lamps. A lot of great tanks have been built using all of the technologies that we see in the hobby today. I've even seen threads of tanks in Thailand and other countries being run using arrays of incandescents. So MH, T5HO/CF/PC/fluorescents, LEDs, etc. all work. Some work better than others for certain higher-ranked (in terms of intensity) objectives (SPS, clams, etc.) and some have different cost-profiles (acquisition cost + operating cost * time + maintenance cost * maintenance cyles - resale value). Years ago, I read that 6500K spectrum (kind of yellow) grew some corals fastest, but with more brown corals resulting. 20,000K seemed to be favored for coloration back then. I just saw your close request.... Closing the thread at OP request.